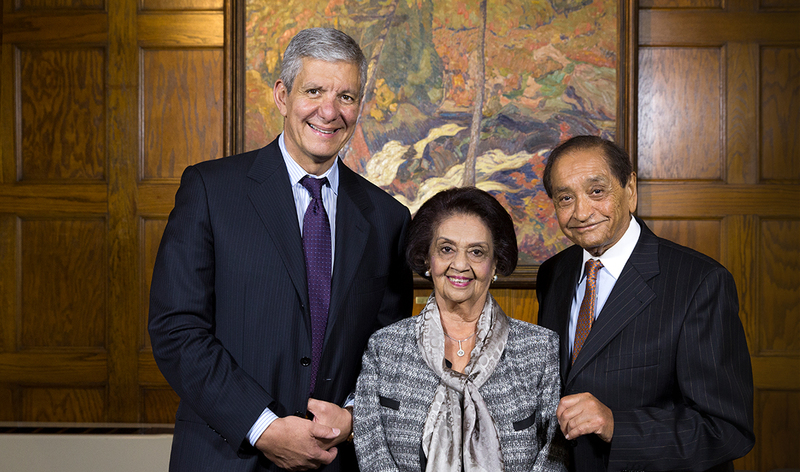 Through an extraordinary donation establishing the five-year-term Nanji Family Chair in Ophthalmology and Vision Sciences, Toronto’s Nanji Family has brought vital new resources to eye surgery at U of T, restoring vision to those in need of care. Following their arrival in Canada from Uganda in 1972, the Nanji Family—Pyarali, Gulshan, and their four young children—have been on a 45-year journey of giving back to their adoptive community through inspirational gifts supporting a variety of causes close to their hearts. U of T was a beneficiary when, in 2017, the Nanjis generously established a five-year term chair at U of T’s Department of Ophthalmology and Vision Sciences, a significant enhancement that has helped the department support key academic priorities and also strengthen their global health efforts. The Nanjis’ commitment has also inspired eye-care initiatives throughout the developing world. Through their support, faculty members—including current department chair Dr. Sherif El-Defrawy, a celebrated eye surgeon, researcher, teacher and Nanji Family Chair—have embarked on medical missions to Uganda, Kenya, Ethiopia, Ghana, Haiti and other locales to treat severe eye-health conditions in patients who would otherwise have no access to advanced eye care. Intensive and often life-changing procedures such as cataract and corneal transplant surgery can restore the gift of sight to those who have lost it or even those born without it, while also enabling regional surgeons and health-care professionals to better serve their communities as they learn from the visiting scholars. After seeing the profound impact of their gift—locally and globally—the Nanji Family generously donated additional funds for scholarships to bring young eye surgeons from low-income and middle-income countries to the University of Toronto to receive additional training.